Don’t be fooled by the title. 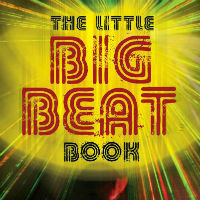 Just like big beat itself, the large living and equally huge sounding musical fusion of dance and rock cultures, there’s nothing little about ‘The Little Big |Beat’ book. Its author, Rory Hoy, was barely born when the genre played out its final moves at the end of the 90s, but that hasn’t stopped him falling seriously in love with the genre. Hoy as well as being a DJ and remixer of some note, has really thrown himself into the task of not only cataloging and explaining but also translating his passion for the music of the big beat genre. Which is fascinating to explore, given that big beat absorbed everything around it, from hip-hop and drum ‘n’ bass, house and techno to indie and rock, and created numerous classic tunes by re-configuring them in their own image, ‘The Little Bit Beat Book’ manages to capture the spirit of those times, the fun of breaking musical rules left, right and centre at a time when most guitar music was slavishly adhering to the backwards looking restrictions of Britpop. There an in depth dissections of all the major anthems of the time. Who knew, for instance, that Cornershop‘s ‘Brimful of Asha’, taken to the top of the singles chart by a Fatboy Slim remix in 1998, was about the political situation in India at the time?! While clearly being a labour of love, ‘The Little Big Beat’ is an authoritative and comprehensive look at this much celebrated but often misrepresented genre. No small achievement, in other words. I did like a fair bit of big beat back in the day, but there was always something a little hollow about it. We had a growing dance music culture, incredible techno and tech house, electro, acid techno, trance, drum and bass… and big beat which was there so that people who didn’t like “proper” dance music could say they did. It was cheesy and obvious, and whilst that has its merits its ultimately unsatisfying… unless you want to judge the music as pure pop, and big beat was not pure pop.